how much have I been riding either type of bike? what’s going on with frame flex? However, more than one person in various forum discussions said I should record maximal uphill efforts on both platforms to provide some backdrop, despite the fact that it wouldn’t isolate a particular factor. As they say in the trade, “discuss”! Remember that this is just the power hitting the ground, not the power going in at the pedals, so that’s certainly a source of significant uncertainty. The MetaBike is supposed to be very stiff and efficient though. I didn’t bother to take HR for a one minute sprint, and in each case I went as hard as I could. The efforts felt completely different though – on the DF I had to dismount and rest before I trusted myself on the 10% downhill; on the MetaBike I just turned around and coasted down, my legs were jammed but overall my body had not been nearly so challenged. (I now realise it might be worth repeating this with a HRM to see what my peak HR is after the effort is over, to try and quantify this). Personally I don’t think this says much about the efficiency of either platform but more the biomechanics/physiology of my performance – there’s no way the MetaBike drivetrain is losing 200W to flex (enough to power 19 compact fluorescent light bulbs!) while it’s easy to believe that I’m just not generating much wattage when I isolate the muscles of my legs/hips as compared to the dynamic action of powering the DF uphill. ~60 seconds to ~90 seconds perhaps includes some kind of boundary of my anaerobic energy systems – so the MetaBike is disadvantaged by falling back onto aerobic pathways towards the end of the effort, compounding the gap in performance. If that’s true and I chose a hill which was a 30 second effort on the DF it should take less than 40 seconds on the Meta (or I could choose a 5 minute climb to compare aerobic metabolism, and hope to see less than 6:48 from the MetaBike). In terms of the ride on the DF, did you remain in the saddle or rise off and use body weight? If so then this might go some way to explaining the power difference? Plus the fatigue you felt over your entire body rather than just the legs. if you remained in the saddle then this is equally as interesting as I would always have thought that you could have the capacity to produce more power on the recumbent as you are able to push against a solid object (ie the seat) and use muscles more effectively. On a longer climb would the advantage initially gained on the DF reduce as overall body fatigue took a greater toll on the rider than on the ‘bent? Personally I do notice the inability to rise out the saddle for that instantaneous push but also note, as you, how relaxed I feel at the end of a long ride on my Raptobike LR compaired to the soggy mess I tended to be in on my DF. I rose up off the seat towards the end of the effort on the DF. Personally I’m not that invested in wattage above ~200 or so, because I want a recumbent for rides of a century or more (200-1200km brevets) and that’s just not a sustainable effort. However, I do know that a lot of people are interested in climbing parity and that’s just not something I see. Walter who’s name I already encountered in the post off the Fujin SL recently posted an article about climbing with a recumbent versus upright bikes. Hope Google translate can help you out further cause it’s an interesting view on the topic. High speed rotating with body flat and stretched in combination with maximum breathing in chest and belly should do the trick. First, congratulations on your site and well constructed articles. This discussion is particularly close to my heart as I am one of those who (a) regretfully accepts that recumbents don’t climb as fast as uprights, and (b) obsessively wants to know why. I know that there are some people who believe one or more of the following: (1) recumbents CAN climb as fast as uprights, (2) its a question of training and adapting one’s leg muscles, (3) the poorer climbing performance is due to fundamentally less rigid frames than uprights. My response to such beliefs would be: (1) maybe SOME people can climb as fast, but this is probably saying more about the physical capabilities of the rider than about the bike (and I also think many are simply fibbing! ), (2) I’m sure adaptation is an important factor, but in my experience it is not enough (or perhaps I’m still not sufficiently well adapted? ), (3) perhaps rigidity is a factor, but I don’t believe it’s the major one. Like you (referencing your flat road test article), I find that climbing performance on an upright road bike is essentially limited by cardiovascular factors; I top out at an elevated heart rate that I can’t exceed or sustain. Conversely, on a recumbent my performance seems to be limited by muscular factors; I simply cannot pedal any harder, or I get pains in my legs (generally around my knees) that prevent me from pushing harder. When I’m climbing as fast as I can I rarely if ever reach the same elevated heart rates that I see on my upright. Now I know this is only a sample of one, and perhaps I am a special case (especially weak?). However, for me, the subjective differences between recumbent and upright when climbing as fast as possible are so distinct and reliable that I am forced to deduce that my poorer recumbent performance is due to biophysical factors and is not down to some mechanical issue with the bike (e.g. chain line efficiency, frame stiffness, etc). If my recumbent (or any other bike for that matter) was simply mechanically less efficient than my upright road bike, I would naturally expect to see a poorer climbing performance as a result. But I would expect my performance to be limited by the same factors that limit performance on the upright; namely, heart rate and cardiovascular effort. I am always interested to hear what others think on this subject, and especially on any objective data or analysis that they can bring to the table. With this in mind, I am happy to share some data of my own. Perhaps it will generate some discussion, either here or elsewhere. Over the last year I have conducted a number of road climb tests on my local “standard” test hill. 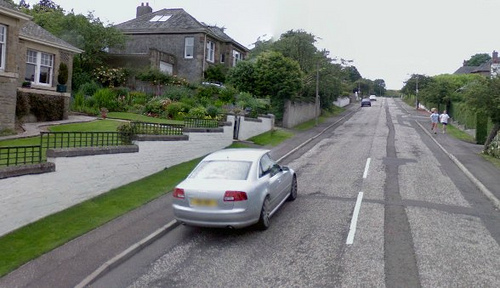 This is a fairly steep (8-10%), twisty road, with a fairly constant gradient and well sheltered by trees. I use well defined start and stop points giving a test distance of 2.92km. I have ridden this test climb, pretty much as fast as I can, on my 9.7kg upright road bike (700 wheels), my home built 13.5kg FWD Low Racer (20″/700 wheels), and my 10.7kg Metaphysic (700) High Racer. All have similar racing tyres (23 to 28 widths). The first thing I noticed about my test results is the HUGE variation in my performance on the SAME bike. On my road bike this was of the order of 20% between the fastest and slowest runs. Perhaps a more serious (or professional) rider would be more consistent, but my personal results highlight the need for multiple trial runs before one can make any scientifically meaningful assessment of the results. As you can see, the upright bike is 1m17s faster than the Metaphysic, and 2m10s faster than the FWD low racer. That’s about 13% and 22% slower respectively for the recumbents! Just a couple of observations on these data. Firstly, the different weights of the recumbents will have some effect on climbing speed. But the combined weights of bike plus rider (75kg in kit) are 84.7, 85.7 and 88.5 kg respectively, so the Metaphysic and FWD are only 1% and 4.5% heavier than the upright with me aboard. Therefore bike+rider weight cannot account for these test results. Secondly, cadence and heart rate. Unfortunately I was unable to capture cadence on the Metaphysic, but the average FWD and upright cadences are very similar, which suggests that I was pedaling fairly seriously (to my ability). The average heart rates also seem similar, but the detailed data show a single, much lower, value in one run on the upright bike which I consider to be erroneous and should be omitted. If this value is ignored, the average HR for the upright bike becomes 157, higher than that for the FWD (151) and much higher than the Metaphysic (146). This same trend is replicated in the relative max HR figures (169 to 160 and 157). I take this as objective support to my experience that heart rate (and therefore cardiovascular effort) is not a limiting factor to performance on a recumbent as is it on an upright. This suggests to me that, especially in the climbing context, a recumbent rider is at some physiological disadvantage to his upright peer when trying to generate as much power as possible over a sustained period. 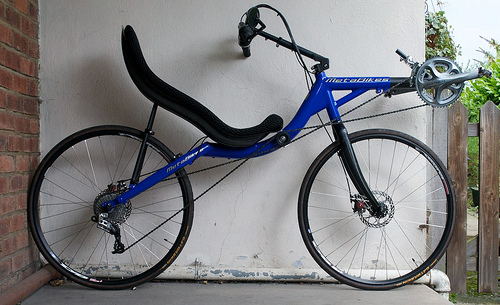 I am fascinated by this subject, and would love to know if – and how – we could make recumbents climb as well as uprights. I hope others who share my interest may find some value in my test results. Your HR observations match mine closely and I’m personally quite convinced that there’s a physiological barrier other than CV – as you say, something else has to be the limiting factor. I’m currently in between bikes but will soon have a load more stick time (I just need to decide between the MetaBike and High Baron, then finish the build). That will allow me to spend some more concentrated time on this. A good subject here and one that needs more research, Nick. Interesting point about variance on the same bike. Great to have some more data on this to add to what Dave has already found. I have to say to people that in most cases their bike will out-comfort other bikes overall rather than out-pace them on the uphills. Bikes such as the Fujin SL do point upwards ok and I have hope that Meta will be a good addition to the range here too. Your data suggests there is hope! It’s true that this is quite a narrow focus area. I can’t sustain a very high HR for any great length of time anyway (and few people would want to). I think I’ve mentioned before that when I first got the Raptobike, with no adaptation whatsoever, I was almost 3mph faster over a hundred miles than on my featherlight Pearson. Sure, it wasn’t possible to climb as quickly but the overall numbers didn’t lie. Dave, you have exactly the same body size as I. You’ve criticism the seat height of the Bacchetta Corsa 700. Cuz of stop-go traffic handling. That sounds plausible. So far I’ve only driven a 650C. It worked great with my body size. What is your experience in relation to the Metabike by using 700-wheels? I have a long-neglected review of the Metabike which I need to complete (I’ve tried two different ones now, 700c and 559)… must get on that! The Metabike was much easier to handle in traffic than the Corsa. Part of that is because of the tiller bars rather than O/C. I did find the handling of the Meta edgy however. I’m guessing that’s intentional, and it wasn’t anything I’d describe as “bad”, just not to my tastes for a long distance bike. I felt like I had to concentrate a bit more to ride it, especially in tight spaces. Ultimately the smooth handling of the High Baron won me over in a direct head to head, so I went with that. Very interesting article and comments. Below is a comment I wrote on Strava after a 55km regular route – “Ice trike! Need to make a decision about whether to use it for potential London Edinburgh London next year. Soooo much slower than a bike – under 22kph compared with 25.8 on the bike. Oddly, despite feeling like hard work, HR average was low and never really got above 150. Is this because you only use legs? If so, you should be able to train your legs to deliver more power using the oxygen and fuel that your upper body isn’t using??”. Doesn’t contribute any to solving the mystery, but it appears to be true for trikes as well. The Trike is a Micro with trick bits – carbon seat etc – so is not particularly heavy. 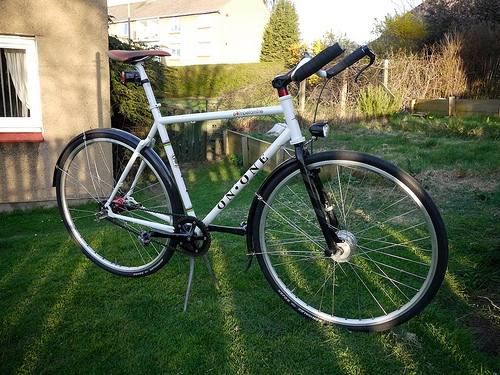 The comparison bike is a Ti Van Nick with a Rohloff, so not a whippet DF. Looking back on my brief notes of rides, one Trike ride I did after a 600km PBP qualifier due to numb fingers got “Hard work on the legs”!!!! I guess a part of this was having tuned up DF long distance legs that objected to doing recumbent duties, but you would have thought a 40km bash round relatively flat lanes would not draw such a comment? Looks like a topic that needs some controlled turbo work! I have a TACX Flow with a PC link – I’ll have a look to see if I can rig the trike to it and see what can be done…. With the recumbent we have to push by muscles all the way up, there is no gravity to help push down the pedals. Anyway I did from Calgary to San Diego, two years ago, fully charged, recumbent M5 Sp559 trailer and bags, in all I had (the worst days) 80kg to push uphill. The body adapts pretty easily and life is not only uphill. thanks for the good review on the Metabike. I am considering getting a used one to upgrade from the Giro. Reduced performace on recumbents has nothing to do with gravity and the legs. Of course, if gravity helps the legs on their way down, it must be worked against in their comeback up! And by the exact amount! – Thats what smart Newton said). It has to do essentially with the effort concentrating on 2-3 muscles in a recumbent, basically the thighs and less so the muscles from lower leg and pelvis. Whith a recumbent, the rest of the muscles do exactly that: they rest. As for conventional, upright bikes, you distribute the effort in a ‘cylic’ manner through a whole lot more muscles, especially when climbing: In an upright you exercise your arms, your back muscles, your buttocks (yes! ’cause ange the angle and geometry of lower body much more, and more forcefully than you do in a recumbent), and many others that are even difficult to imagine. 1. Differences appear essentially when climbing, much less so in flats (apart from the fact than in flats, the better aerodynamics favor the recumbents, while aerodynamics have little influence in uphills, because of the lower speed, but thats another story). 2. Even when recumbents are slower when applying the same maximum effort, the power output appears to be LOWER with the recumbent. And still, subjective fatigue is the same or even higher. The reason being, you have relied on a small number of muscles to do all the effort. When you get to the top, you are just as tired with the recumbent (by definition, since you did an effort-limited test), but your oxygen comsumption AND your measured power output were lower ! 3. The disadvantagen for the recumbents in uphills decreases to a certain amount with time and with training. Of course, you train especially those particular muscular groups that are over-stressed. Very fit riders ALMOST do as well with a recumbent as with an upright bike. But they never can be the same! 4. Other ‘mechanical’ factors play essentially no role at all. Of course, bikes are all efficient mechanical energy transducers, transforming chemical energy into muscle mechanical work, and this into mechanical power, with minimal energy loss -chain, drive train, lubrication, geometry and so forth, all contribute so that any mechanical energy loss is minimized, both in recumbents and upright bikes. It cannot explain the evident, sizeable differences that are seen in ‘efficiency’ when climbing. 5. To minimize the limitations of recumbents in uphills theres only one way: Improve your physical condition, train your legs muscles, and get the lightiest, more rigid, well lubricated bike and the smoothest tyres you can get. Recumbents are ridden because they are fun, comfortable and extremely aerodynamic, much faster in flats and downhills, inevitably slower in ups. Thats the reason we still ride them, because we enjoy.